This Bwindi mountain gorilla tracking holiday in Uganda is a four day trip that can be combined with a safari in Uganda or East Africa. It’s also ideal for anyone short on time, but eager to trek with mountain gorillas. We use a domestic flight, from Entebbe to the Bwindi Impenetrable Forest. You’ll spend two nights here, tracking gorillas and enjoying some optional hikes if you wish, before flying back to Entebbe. Using a domestic flight to reach Bwindi Impenetrable Forest has many advantages. It cuts out two full days of driving but, when travelling in a small group, produces less carbon output per individual than driving. A quick flight means you have more time in the area, so you can make the most of the forest and perhaps enjoy visiting one of the conservation and community-based projects here. The flight itself is spectacular, too, with spectacular views of Lake Victoria and Central Uganda. Any person lucky enough to who trek the Mountain Gorillas in Uganda contributes to the continued survival of a population numbering less than 900 remaining in the wild. Buying a gorilla permit funds the various rangers, guides, vets and support personnel whose daily task it is to monitor and ensure the welfare of these wonderful creatures. The same concept applies for the trekking of Chimpanzees, whose numbers are not quite so dire, but are still very endangered and again benefit immensely from tourist visitors. As well as being an annual corporate sponsor, we donate $15 of your holiday price directly to the Uganda Conservation Foundation, a key player in protecting not just our primates, but other magnificent wildlife such as our elephant and lion populations. We also give you the option to match this donation should you wish. In selecting accommodation for this itinerary, we have only used small lodges or camps; each with their own Responsible Tourism policy. Most run on solar power and harvest rain-water in order to minimise their footprint on the beautiful natural reserves in which they are situated. Most of these camps are built using locally sourced materials where available. 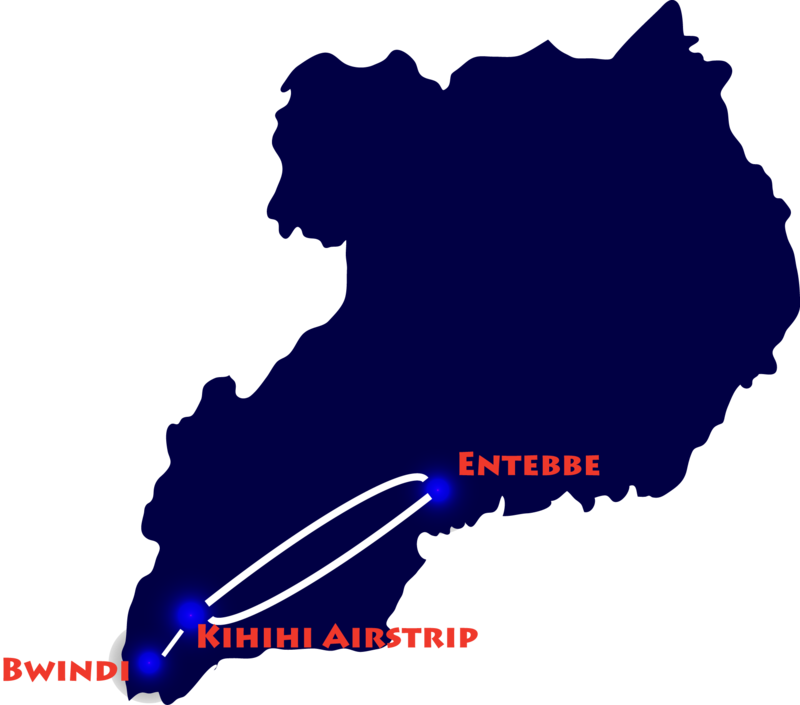 This particular itinerary uses light aircraft to access Bwindi Forrest. This is not only a more efficient use of your time on holiday, but we’ve actually calculated that for a small group of people; using a scheduled light aircraft for a one hour flight has a lower carbon footprint than the 10+ hour drive in a 4x4. We are a grass-roots Ugandan company; hence the vast majority of your holiday price goes directly to supporting Ugandan service providers, wildlife foundations, Ugandan people and their families. Being based in Uganda, we’re not paying big rent for some flashy sales office and all the overheads that come along with it. So not only can we give great value for money, you know that the end recipients of the money you are paying are real people here in Uganda, many of whom you will meet when you travel with us. As another part of our lodge/camp selection criteria; we ensure that the lodges we use recruit the majority of their staff from the local area. As many lodges are in rather remote locations, employment and training opportunities for local people are not as abundant as for those whom live in Uganda’s towns. This way you’ll be sure to experience the local culture (Uganda has over 35 tribes and over 40 different spoken languages!) and know your stay contributes to supporting families in the local area. In addition to our contribution to the Uganda Conservation foundation, an additional US$15 per person from each trip sold is added to a fund which every six months (or when there is a reasonable amount) is donated to a deserving charity or organisation in our local community. We only approach parties whom we know personally and ones that do not already benefit from large amounts of funding. This way we are directly involved and can ensure the money is spent effectively. Current potential recipients are an Entebbe street-dog neutering project, development of a small recycled glass business, or an extension to the animal housing facilities at the USPCA in Kampala.